Plenty of storage with custom built in shelving. A very luxurious feel is provided by the custom designed cabinetry throughout. High quality custom made window treatments finish off the fenestrations nicely. Faux painting finishes and texturing in many rooms gives a high end look and feel. High end wood trim throughout. Sturdy plantation shutters give extra privacy in many rooms. There is ample space for the fashion conscious in the huge master bedroom walk in closet. The built in, den, gun cabinet is ready to store your prized arsenal. Energy efficient Pella casement windows also look amazing. The dual function fireplace is cozy, warm and comfortable, and also burns wood or gas fuel. Deep colored granite countertops throughout give a very rich feel. Clean water reverse osmosis system is in the kitchen at your fingertips. Future framing is already installed, ready for an easy conversion to a 4 bedroom home. One-of-a-kind look with hand crafted, leaded glass doors, sidelights and fireplace windows. Interior insulation provides sound dampening, reducation throughout. Enjoy your gatherings with the surround sound system in the bar room and more. Easy attic access from many locations. Never run out of ice with the ice maker in the bar. Personal sized fridge in hidden master bedroom cabinet for your night caps and refreshments. Double shower heads are installed in the large master bathroom shower. Clean the home with ease with the central vacuum system, motor replaced, with multiple room hoses. 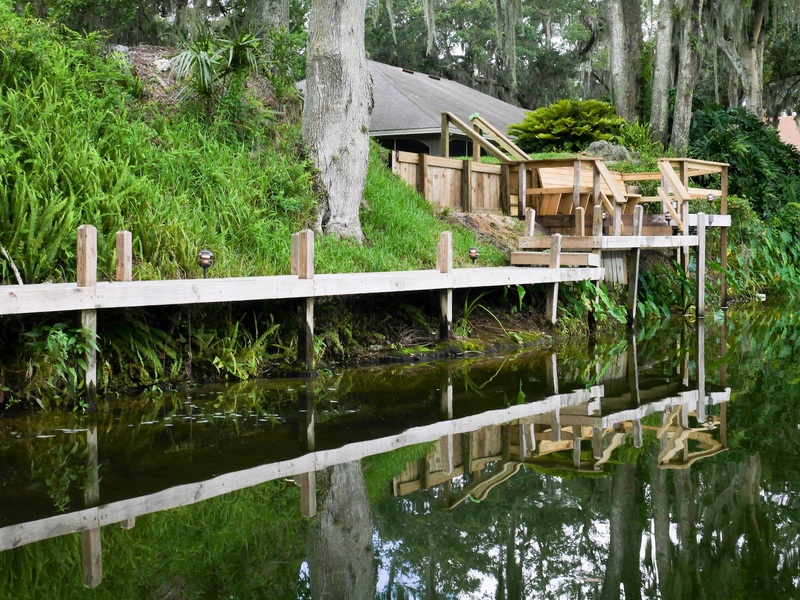 Almost 1.5 acres, a double lot, on Crescent Lake, provides privacy and a tranquil surrounding. Oversized, side entry, 3-car garage, high enough for a car lift and your collectors items. Extra heavy duty pull down attic staircase in garage. Custom painted floors throughout garage area, good for cleaning up spills. Private work bench, tool room, in garage for your handy man projects. Feel safer with the security system, owned, ready for use (cameras have not been updated). Professional landscaping lighting throughout grounds creates an elegant exterior feel. Feel more private and tranquil surrounded by the mature, lush, landscaping. Decorative brick walls designate the home site boundaries. Extra strong, engineered replacement pool cage is not going anywhere soon! Replaced pool, water fall and hot tub spa, resurfaced and new tile ready for long use and fun. Real Western rock imbedded pool decking (no pavers here) create a very luxurious feel. Replaced pool heater provides less worry of early replacement. Enjoy a place to relax on the covered, lit, gazebo with bench and private lake view. Read a book or soak up the sun on the rebuilt dock with sitting area and berth. Easy roof access via full sized screen door on the second floor. Two water conditioners save you money when you use less soap, and they help reduce mineral build up in plumbing fixtures. 2 system plumbing design. Genius. Repairs can be made on one system while the other is fully functional – never go without water! 3 air conditioners, all replaced, make all areas of the home very comfortable. 3 water heaters, 2 replaced, for constant hot water in whichever baths are being used. Whole roof replacement in 2003 should last several more years without worries. All kitchen appliances replaced. Black installed to avoid finger prints left on stainless steel. All plumbing hardware and fixtures replaced. 3 toilets replaced with ergonomic design. Extra attic insulation for even better energy efficiency. You will be hard pressed to find a home so well cared for over time. Contact 863-640-2246 today to request a private viewing of this beautiful, custom home.